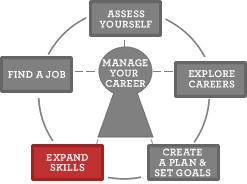 The Expand Skills section will help you learn about ways to expand your skills. One of the best ways can be through education and training. In this section you'll see some education options that help you expand skills. You'll see benefits from going to school. Also, you'll learn some tips to find the right education for you.